Practice makes perfect; it’s a well-known idiom. Whatever we practice most is what we become. If we are in the habit of being nervous or anxious whenever our lives aren’t going quite right, or if we repeatedly react to criticism by immediately defending ourselves, if we constantly insist on being right, if we allow our thoughts to dwell on adversity, then our lives will surely reflect these practices. We will be riddled with and constantly rattled by anxiety, defensiveness, and worry. We will live in a state of frustration because we have practiced being and feeling frustrated. On the other hand, we can choose to practice compassion, kindness, humility, peace. Practice really does make perfect, and the more we practice these softer, gentler qualities, the more we can perfect them in ourselves. This is not suggesting that we should never experience fear or doubt or frustration. All of us are filled with human foibles. However, being conscious of our habits, both internal and external, is a good thing. Where do you place your attention, and your intention? Are you cultivating habits and practices that help you, or hurt you? If we remember that we become what we practice, then we might start nurturing better habits. It all begins with awareness. It's okay to start small. As for myself, I have begun practicing the art of smiling. I offer one to grocery store clerks, neighbors, even strangers I meet. I'm usually given one in return, and it feels pretty good. What new habit will you cultivate? USA Today Bestselling Author Donna Fasano has written over 30 romance and women’s fiction novels. Her books have won awards and have sold 4 million copies worldwide. Learn more about her at her blog, or connect with her on Facebook, Twitter, and Pinterest. She loves to hear from readers. Excellent blog, Donna – and an excellent book, too. Wonderful advice. I've been practicing to smile at each person I have eye contact with, and I can't remember anyone who hasn't smiled back. So it really does work. I think a smile is a universal language, don't you? :) Thank you for stopping by. Lovely advice. . .and so true! I had a chance to read your book. Such a heart-warming story. Nice blog post, Donna, and very good words of wisdom! I love that you are practicing smiling - it's amazing at just how one kind intention can turn someone's entire day around. I'm trying to work on patience - especially when it comes to my kids. I find I spend so much time being "busy", that I don't focus near enough on what is truly important, namely my family. Sending lots of **smiles** your way! Patience is a wonderful virtue to practice! Blessings! Great blog Donna, You aren't a mind reader are you? as your blog touches home with me. I am trying to be less stressed and you are helping by providing fabulous books for me to read. What a wonderful post, Donna. The world would be a better place if everyone read this and then tried harder to do all of this. I need to send that smile more often! Sometimes I allow all the stuff going on in my head to miss the beautiful things around me :) Great advice Donna! Great post Donna. As part of my NY resolutions, hen things don't go the right way, I tell myself: "So what it's not the end of the world." I have always been a smiler, but I took it for granted until we lived overseas. Even when your ability to communicate is seriously hampered, you can always smile. Now I realize how important my smiles and the smiles of others have always been to me. My 5-year-old daughter recently told me she did have any talents. I told her that God had given her a beautiful smile and that she could always use that to cheer others up. She was relieved, and I relearned the lesson while teaching it! Thank you for sharing. A smile goes a long way. Fabulous post, Donna! I love the act of smiling at strangers - and it most often results in them smiling, too. My "one thing" I'm intentionally focusing on this year is gratitude... counting the blessings in all things and feeling true thankfulness each day. 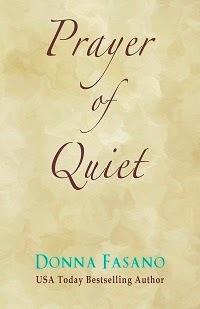 Quiet of Prayer is an excellent book. I've reread and suggested it to others, and I hope Donna writes more like it. Also, like Shanna, I think focusing on blessings is also huge with me.